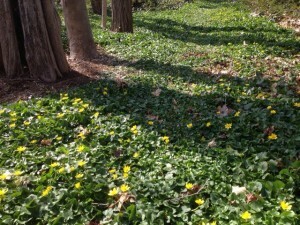 When lesser celandine (Ranunculus ficaria) came up in a shady moist part of my yard, I admit, I did not promptly rip it out, though I do know it is a confirmed Invasive Plant Species, on the official Connecticut List. I realized that this patch probably originated from a bulblet that I had tracked back from the floodplain after field work, likely stuck in a boot tread. Its glossy, yellow petals were like those of a buttercup or marsh marigold, only there were more of them (eight versus five). 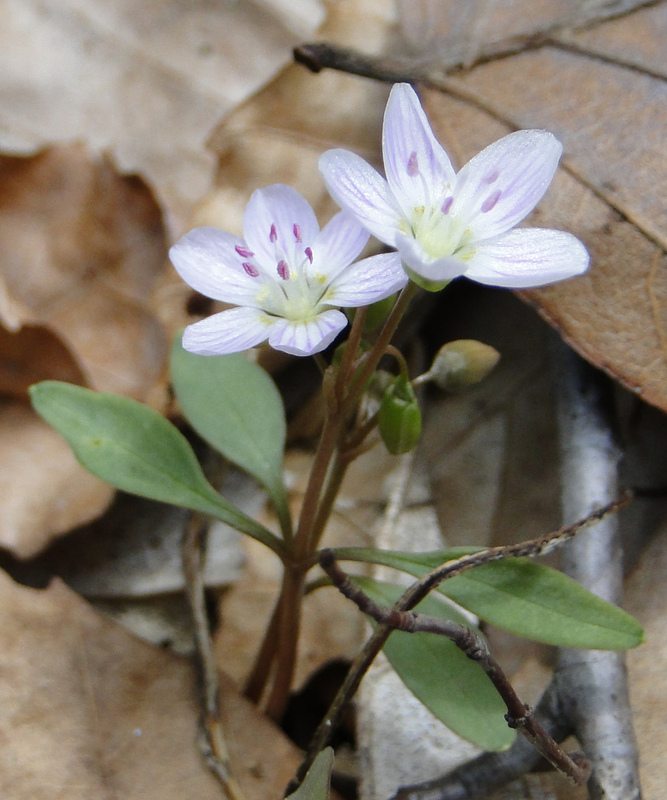 The dark-green, scalloped leaves were shiny and heart-shaped, and formed a full, weed-free ground-cover, though spreading far less than the patches I had seen on the Quinnipiac River and Wharton Brook floodplains. I rationalized that this species was invasive in wetlands, not upland yards, so… I might as well let it grow and study it. When seed set failed altogether, I was reassured that seeds could not disperse to the Ten Mile River floodplain, only half a mile away. As a spring ephemeral, the lesser celandine dwindled as the tree canopy expanded, and by August I saw only a few yellowed leaves- and many bulblets. I erected a barrier of logs and brush so no one would walk there and pick up bulblets in their shoes. Ranunculus ficaria spreads aggressively by bulblets in river floodplains, where floodwaters move the buoyant bulbs around, but I had rationalized that my patch was innocuous as a small sterile clone in an inland, upland setting. Two years later, my friend Jeanne Chesanow showed me a similar, small sterile patch of lesser celandine in her yard, also in shaded, mesic upland soil. She lives about a mile south of my house. I started to wonder, just how far do bees fly? Lesser Celandine is reported to produce fertile seed erratically. Seeds may not have not formed in my and Jeanne’s clones because the female flowers must receive pollen from a genetically different mating type, and none grow nearby. However, with cross pollination between lesser celandine patches in multiple gardens, how soon will a threshold of abundance be reached, such that lesser celandine starts setting more viable seed? If that happens, will this plant “take off” in mesic, upland habitats, as well as river floodplains? Purple loosestrife spent many decades in the twentieth century, as a well behaved garden plant, producing few fertile seeds…. until that abundance threshold was reached and self incompatibility was no longer limiting. Only then did it start proliferating in a wide range of wetland and moist habitats. This is a particularly tempting invasive, the more so because it forms a natural, attractive ground cover, and is hardy and carefree. It is widely sold! Most gardeners are probably unaware they are harboring an invasive species, may think it is Marsh Marigold (Caltha palustris). 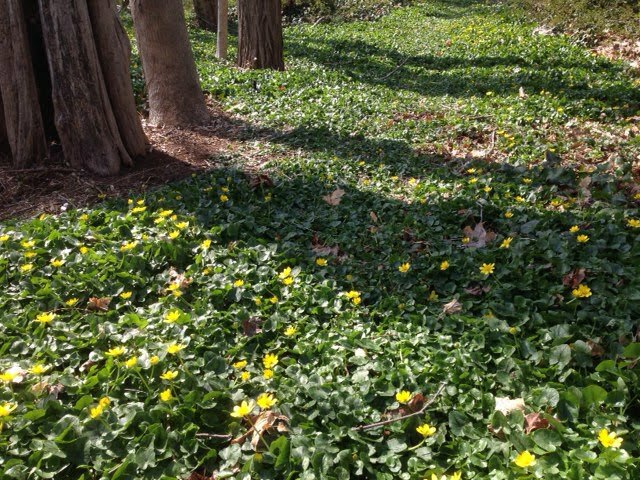 I wondered, just how many other yards in Cheshire also have celandine patches. It was time to stop playing around. I dumped a thick layer of mulch over my patch, and Jeanne got rid of hers as well. Digging it is risky, as bulblets are dispersed. A year has passed, and it is early spring, mud season. My garden has no yellow celandine flowers. As a weekly erosion inspector at a school construction site, I am trying to persuade the contractor to spread hay over the idle bare soil, to reduce the export of fine sediment and phosphorus to the Quinnipiac River. I wonder, could the yellow-dotted carpets of Celandine over bare, floodplain soils actually benefit the river and Long Island Sound, by reducing phosphorus loading to during the early spring season? However, especially in moist floodplain habitats, large mats of lesser celandine obliterate other delicate spring ephemeral wild- flowers like trout lily, wild ginger, and spring beauty, and also compete with perennial sedges and spring-germinating annuals. However, lesser celandine is reported to be much less less invasive in uplands than floodplains. Could this plant be useful as a spring ground cover for landscaping, in well-drained soils, until other garden perennials have reached summer biomass? Could it help reduce lawn areas and turf chemical use, to protect downstream water quality? More funding is needed for applied research, to more precisely understand which habitats are most vulnerable to a given invasive species, and also to study breeding systems. Is increased production of fertile Lesser Celandine seed really a threat? This entry was posted in Botany, Invasive Species, Native Landscaping, Uncategorized, Water Quality. Bookmark the permalink.